The -ICD devices on these headers are specifically designed to select a device without the use of additional jumpers or switches. These headers support 8 and 14-pin devices (see "Header Dimensions".) For the AC162059 and AC162070, there is an 8-pin and a 14-pin connector. For the AC162096, there is only a 14-pin connector. (The 8-pin connector is not populated.) 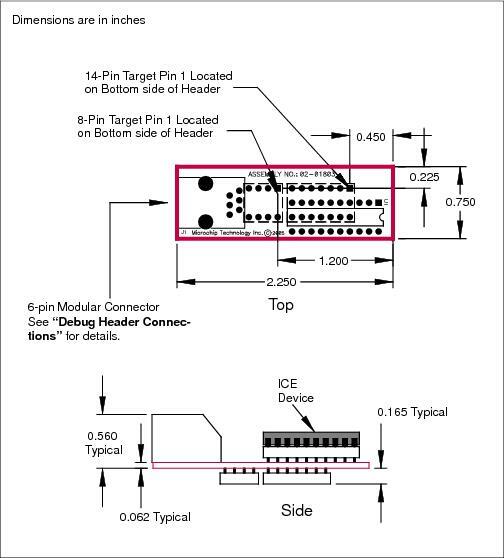 Use the 14-pin connector for 8-pin devices, but make sure device pin 1 is placed at the 14-pin connector pin 1.